On the Sea Wall (Blue-Tinted Area). You’ll need to explore the Gyre to learn what elemental energies each plane provides, but your guide can provide you with some information from her own travels. She just watched the mirror-like plane crash (plane 53), which was Av. Five others appeared just six months ago, and though she has explored some of them, she doesn’t know their names. They include a world made of ruins of old civilizations layered atop each other (plane 49), a sea with scattered islands she couldn’t reach (plane 48), the gold-flecked asteroids where she found you (plane 47), a world of wind-carved stone landmarks that floated too far away for her to reach (plane 44), and a distant plane of obscuring sands (plane 39). She also watched another world, like a silver ring, be carried north toward the teeth of the Gyre. It looked like it was being pulled by a white comet. She couldn’t follow, because there’s a gap between the southern and northern planes. She stole a map from a Golden Legion ship which showed the locations and names of planes there, but no details. Only a few planes here are truly ‘safe,’ including the windy forest of Caeloon (plane 50), The Plain of Rice (plane 51), and the mountains of Dunkelweiss (plane 31) where rivers of beer flow. Bhoior (plane 41) is eerie – the whole world is a giant, possibly undead turtle where odd voices seem to call to you – but nothing ever accosted your guide while she was there. Several planes are naturally lethal. Padyer (plane 52) has water that burns like fire. The beasts of Thrag (plane 37) are terribly fast, strong, and cunning. The salt flats of Amrou (plane 36 & 40) are vast, have no water, and are dotted with tombs of mummies. The snowy Wilanir (plane 35) has mists that roll in unexpectedly. She never saw any predators there, but she often found dead prey animals in the wake of a passing fog bank. The inhabited planes are mostly hostile. If you linger on Shabboath (plane 45), dreams will compel you to enter the flooded tunnels where some massive creature slumbers. The sea of Hunlow (plane 33) is controlled by pirates who kill or capture every outsider, and they take their slaves to an abandoned city, Drozani (plane 25), which floats in the clouds. Perhaps the only friends you might find are the goblins of Etheax (plane 29), but they treat everyone as friends, even the pirates of Hunlow. A few worlds are completely empty, either plundered ruins or just drifting motes of dead rocks. Across the deep void, your guide knows that the Golden Legion is based in Egalitrix (plane 18), which resembles an erupting volcano. And she is intrigued by the mystery of a lighthouse on a place they called Ascetia (plane 24), which seems to beckon for people to come. She knows nothing about the other planes of the north, except the names of a few. 1. Reida Life, Time Strong prophecy. 2. Teykfa Earth, Time People are more aware of the scale of time, and they can better weigh long-term consequences. Time can be manipulated. 5. Bonilathe Air, Fire Storms spawn creatures. 9. Metarie Life, Water Technology is disrupted. 12. Guay Life, Space Dreams create demiplanes. 14. Ringes Earth, Water Murderous violence. 15. Gardboral Air, Life Elementals are common and massive. 16. Apo Death, Space Intermittent spheres of annihilation. 17. Iratha Ket Life, Death Greater altruism. Occasional spontaneous musical numbers. 18. Egalitrix, fortress of the Golden Legion Fire, Space Fantastic grand industry will develop, driven by greed. 19. Obliatas, the devouring light Any Undead are destroyed by the sun. 21. Elofasp Earth, Life Giant obedient beasts. 24. Ascetia, the hidden jungle Life, Time People are more aware of history. 25. Drozani, a dead city in the clouds Air, Death Slowly the birth rate dwindles to zero. 31. Dunkelweiss, the Fermented Peaks Earth, Life Alcohol is good for you. 33. Hunlow, the place for pirates Death, Water The ocean is literally a bloodthirsty god who loves villains. 35. Wilanir Air, Water Dense mists bring ill tidings. 39. Apet, the Distant Plane Air, Space Planar travel is limited to the local system. 44. Avilona Air, Death Flight is limited to five minutes. 47. Urim, the shattered golden chain. Earth, Space Gold blocks teleportation. 48. Mashiva Water, Time Islands conceal secrets. 49. Nem Death, Time Lingering souls are stronger than corporeal undead. 50. Caeloon, the paper wind Air, Life People are more resilient in the face of tragedy. 53. Av Death, Life Conjures physical reflection of whatever world it orbits. 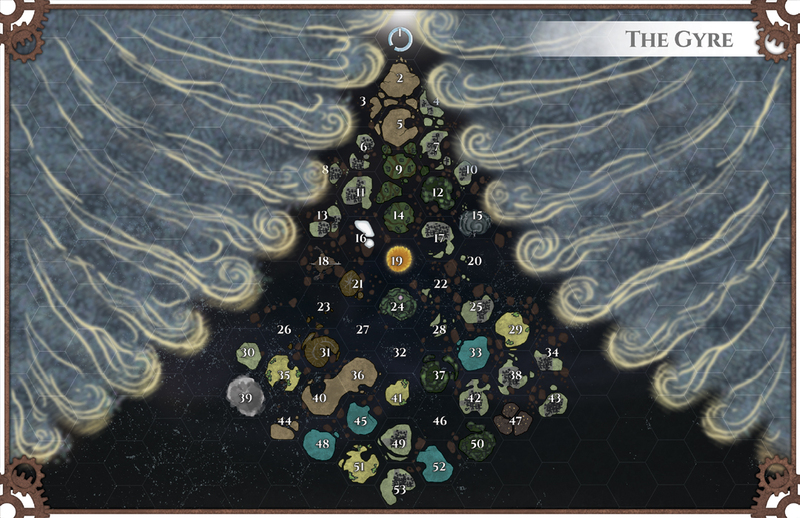 Each hex of the Gyre map is 30 miles across. The gaps between planes are exaggerated for style. The surviving pieces of planes don’t fill the entire hex, so in some places miles of empty space can separate two adjacent planar motes, but most neighbors have at least a few spots where jutting landforms literally grind together. Crossing on foot entails a bit of ranging about, and then some perilous rock climbing. The main exceptions are Avilona, which must be flown to, and Drozani, whose staircase access is guarded by fallen angels of Hunlow. New worlds usually arrive only once every few decades, and the worlds’ progress toward the Gyre’s teeth takes about a century for every thirty-mile hex traveled. For instance, Teykfa (plane 2) has been in the Gyre nearly a thousand years. Some individual worlds will have their own specific traits, but in general the following rules apply in the Gyre. A God Dwells Here. Any creature with links to divine power—clerics, paladins, angels—sense that while they can still hear their own deity for now, there is a god physically here in the Gyre. Those creatures innately know the god desires followers, but nothing more of the god’s nature. They always feel a slight tug in the direction of Hunlow (plane 33). Dead End. It is impossible to travel out of the Gyre, except by passing through the gears. This typically is lethal. Any effect that would let a creature travel to another plane can function as a sort of teleport to any of the worlds in the Gyre, but if an effect would take a creature to a plane outside the Gyre, a devastating manifestation occurs. Shining mist, like the nebula itself, appears surrounding the creature that was going to travel. The mist grinds into the shape of cogs, large enough to crush the creature, and then the gear teeth pull at the target. The area becomes a zone until the end of the combat. At the beginning of each round, make the following attack centered on the creature targeted with banishment. Attack: Close burst 1 (creatures in burst); +40 vs. Reflex; Hit: 20 damage and the target is restrained (Escape DC 40). While it is restrained it takes ongoing 20 damage. The pirate priests of Hunlow are particularly dreaded because they always prepare banishment effects, which rather than sending creatures to their home plane simply grind them to nothing. Similarly, no magic short of the power of a god allows communication into or out of the Gyre. Bags of holdings and the like still work, though. With Teeth. The sides of the Gyre are lined with whorls of dim crackling debris that segregate into thunderheads and troughs eerily reminiscent of the teeth of a gigantic cog. Anything that goes into those areas is slowly ground to dust in a matter of days, but it is possible to pass through temporarily. Two Dreams. Eladrin here have both their fey step ability and ability to affect incorporeal spirits. Variable Gravity. Gravity for individuals is objectively directional toward the ‘bottom’ of the Gyre, even though there’s nothing ‘down there’ to exert a pull. Falling is slower than usual, and a creature only descends 60 feet per round. Particularly large objects have their own strange gravity that causes them to drift near each other in chaotic paths that rarely intersect, and these paths can be affected by magic more easily than one would expect. Any sort of telekinetic effect that could move an object of at least 300 pounds can move an object as large as 100 feet across, albeit no more than 60 feet per round, and once intentional control is released the objects will shift back to their previous pathways. Weather. Wind is light and seldom stronger than 30 miles per hour. Rain clouds do manifest occasionally, but it only ever snows on Wilanir and Dunkelweiss (planes 35 and 31). Passage of Time. The Gyre normally glows about as bright as the Milky Way, but from all sides, providing more light than a full moon at all times. Only caves or odder geographic features can blot out enough light to create full darkness. The people of the Gyre keep track of time by the steady rhythm of Teykfa (plane 2), a massive clock that floats near the teeth. It ticks once every twenty-seven hours, creating a sound like thunder that can be heard the length of the worlds here. Occasionally, when things are just quiet enough, you might hear a brief melody chimed on bells, ringing every fifty-one minutes. To create a planar icon, characters must succeed two DC 30 checks – one Arcana, one Nature. A single character can make both checks, or two can cooperate. Once a character has formed a link with a plane, he channels the world’s energy into some small object that will act as the icon. Any handheld object can function as an icon. The time it requires to create the icon depends on how strong a bond the character has with that world. If a character is studying the plane from afar (such as by a telescope as the Obscurati did on Axis Island), it takes a year to craft the icon. Actually being on the plane reduces the time needed to a month. Whenever a character begins to make an icon he intuitively knows that this would go faster if he could form a meaningful bond with the world. That entails either accomplishing a great quest for the survivors of a world, or sufficiently understanding the cause of the world’s demise if there are no survivors. If the character has such a bond, crafting the icon only takes a month from afar, or only an hour if the character is actually on the plane. Because the party knows exactly what happened to the planes that were linked to their world, they only need an hour on those worlds. After an icon is created it steadily absorbs energy, and over the course of a few centuries it will become a magic item with some minor powers related to its plane, which some future adventurers can find. Each plane provides elemental energies, which the party can easily determine via the Gidim vortex array. Additionally, every plane will grant some trait to the party’s world if they use it in the Axis Seal ritual. Those traits are a bit more subtle, and while the party might easily guess that some places (like Padyer, where all water burns like fire) probably are too dangerous, if they want to know for sure they need to succeed two DC 40 checks – some combination of Arcana, Insight, Nature, and Perception depending on the details of the trait. Each attempt takes an hour, with a +5 bonus if the party sticks around for at least a day. Once the party succeeds both, they get a clear enough sense of how the world differs from their own in order to predict what trait it would grant. Successfully crafting a planar icon provides this information automatically. Crisillyir’s legal system is not as advanced and scientific as Risur’s. The party will mostly need good rhetoric, and should play the crowd while discrediting each of Savina’s accusations. Unlike Drakr and its philosophical debates, the tribunal of the people are a mob, and they’ll be swayed by emotions, not logic. Evidence is secondary, best revealed for a dramatic conclusion. Since the PCs will be watched by the angels, lying will likely be discovered, which will ruin their credibility. Deceptive phrasing works, though. And luckily no one will question their statements, no matter how outlandish they may be. In a ‘trial’ of this sort, since there is basically no physical evidence, what matters is precedent, dogma, and scripture. The two angels each can magically detect lies (Bluff DC 42 to lie without being detected), and before anyone can speak they will try to dispel any magical effects on the speaker. For each of the Legate’s three arguments, one Diplomacy check represents the counter argument, and closing arguments require a final Diplomacy check, with a +5 bonus if the speaker has experience entertaining crowds. For each of these, the PCs can attempt the following checks to improve the party’s Diplomacy check. Time constraints limit each PC to only one bit of aid on each of the primary checks, and none of the following options can be used more than once to assist a given check. Bluff. If the party can manage to outwit the angels’ lie detection (Bluff DC 42) the speaker gains a +5 bonus to a primary Diplomacy check. Diplomacy. A DC 30 check lets the party take advantage of pauses in the Legate’s rhetorical flourishes to interject and throw off her pacing, but to do so politely and with the right decorum so it does not upset the crowd. This grants a +2 bonus to the primary Diplomacy check for that argument. Intimidate. A DC 30 check is able to slightly turn the angry crowd against Legate Tullius. This grants a +2 bonus to the primary check. History. A DC 20 check dredges up an obscure fact about Clergy history, granting a +2 bonus to the primary check. Streetwise. A DC 20 check injects a bit of local culture that the crowd responds to well, reducing their skepticism of the party as foreigners. This grants a +2 bonus to the primary check. Nature. Savina’s first point criticizes Elfaivar and Risur, but a DC 15 check can cite elements of the faiths of those nations to show they are not actually inimical to the Clergy. This grants a +2 bonus to the Diplomacy check to oppose the Legate’s first point. Religion. Legate Tullius is a master scholar of her religion, but a DC 35 check shows the PCs as equally familiar, granting a +5 bonus to the primary check. Linguistics. If the speaker is originally from Crisillyir, he or she gains a +2 bonus to the primary check by using the proper language for this trial. Insight. The crowd wants blood, true, but more importantly they want this all to have meaning. A DC 30 check forms a rapport with the audience and helps get them on the side of the speaker. This can be attempted once per primary Diplomacy check, and each success grants a cumulative +2 bonus (so potentially a +8 bonus on the final check). Once the party has pooled their ideas, articulated the general structure of their rebuttal, and made their checks to aid, have the main speaker make a Diplomacy check for the three points of the prosecution. You might grant a modifier of up to +5 or -5 depending on the quality of their ideas, and if they actually bring Ashima-Shimtu along, they get a +2 bonus to their checks. If they don’t have the biography of Triegenes, though, that’s a -5 penalty. Finally, the party has an odd ace up their sleeve that the biography reveals Triegenes never became a god. Revealing this is deathly risky, though, because the crowd will respond in denial and anger. The threat of such a reaction should be obvious to the party. Liss starts at Mile 128 (–18). Griento starts at Mile 164 (+18). They’re competing to reach mile 146 (+0). Miles: To build a mile, you must expend 1 Materiel. Each mile after the first in a given day also costs 1 Morale. Materiel: Each day you can expend Money, and the next day you acquire an equal amount of Materiel. For each 1 Money spent beyond the first on Materiel, there is a 5% chance of a mishap. A mishap causes 1d4 of the Materiel you ordered not to arrive. Morale: Certain events add or subtract Morale. If Morale goes below 0, you cannot build. You can buy 1 Morale for 2 Money. Obstacles: Bridges are required at miles 132, 143, and 155. Bridges cost (and earn) as much as 5 miles of track. Disruptions: A delayed train keeps Money and Materiel from arriving. A destroyed train eliminates the Money and Materiel. Rebuilding a destroyed bridge is equivalent to building 5 Miles of track. Attacks cost 1 Morale per day (or more at the DM’s discretion, if they’re very disastrous). Key personnel typically cost 1 Money to replace. Acquired a Steam Crew for 1 money (9 owing): The Steam Crew can build 1 extra mile per day without costing any Morale. Dismantle Kell’s guild and force him into the open, then take him down. To do this, send the 50 police officers of your task force on missions to acquire leads, take out Kell’s support, and eventually attack his strongholds. 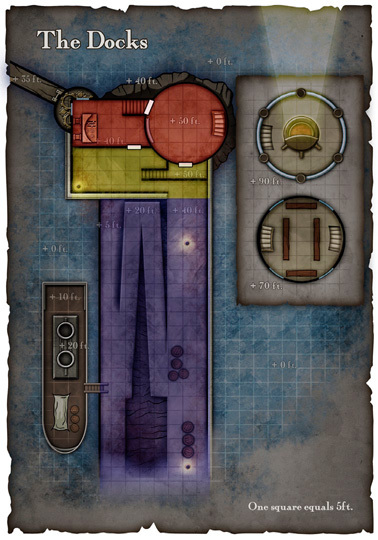 Kell’s seat of power is the Theater of Scoundrels, in the district Parity Lake. He’s known to have three lesser strongholds: a fancy tower called Grand Suites, and a mansion dubbed Casa de Kell, both in Parity Lake; and a gated compound called Machete Hill in The Nettles. The guild likely has affairs in other districts. The districts of Flint include Bosum Strand, Central, North Shore, Parity Lake, Pine Island, Stray River, The Ayres, The Cloudwood, and The Nettles. Each officer can perform one mission per day, and you have four days, from Spring 9 to Spring 12. You can call in favors for additional aid, and can go on missions yourself, but each mission you join takes 4 hours of your time, and there are other matters that need attending. For each mission, choose how many men to send and which district to send them to, then roll the officers’ skill check (use a default +10 bonus). If you accompany, use your skill modifier instead. This check determines success or failure. The GM may call for an additional check to avoid a mishap. For instance, the Scout mission requires Perception to see how many thugs are at a location. The GM might ask for a Stealth check to keep the thugs from spotting the surveillance officers and attacking. Each mission has a Minimum Officer entry and an Optimal Officer entry. Take a –5 penalty to the check for less than optimal, or –10 for less than minimum. Successful missions can acquire Task Force Tokens (TFTs) and Strikes. TFTs help on later missions, and Strikes erode the guild’s cohesion. Failure wastes time and might cause casualties. Front. Guild-affiliated business. Low resistance. Den of Thieves. Guild hang-out. Medium resistance. Illicit Transaction. Major scheduled crime. Medium resistance. Stronghold. One of three well-defended compounds within the city. High resistance. Theatre of Scoundrels. The guild’s seat of power in eastern Parity Lake. Very high resistance. You can trade in a Task Force Token before a mission to get +2 to your roll for that mission. Case a District. Diplomacy or Streetwise. Look for fronts, dens, and transactions in one district. Success reveals 1 or more items of interest. Minimum officers 2. Optimal 6. Scout. Perception. Choose a known location and find out about it, including number of defenders. Minimum officers 1. Optimal 3. Bust Up a Joint. Intimidate. Go into a Front or a Den of Thieves to look for information. Success earns 1 TFT at a front, or 2 TFTs at a den of thieves. Minimum officers is equal to number of defenders. Optimal is three times that many. Sting. Intimidate. Swoop in during an Illicit Transaction. Success earns 1 Strike and 1 TFT. As above, you want three times number of defenders, but you cannot scout for a sting, so be careful. Assault. Attack a stronghold to earn 1 Strike. Attack the Theatre of Scoundrels to earn 3 Strikes. The party might use their Risur Prestige to call in favours and get some military additions, or to get some officers to work even longer. For example, it’s a Level 2 favour to get 1 extra officer for a few hours (long enough to send them on another mission), Level 3 for 4 officers, Level 4 for 12 officers, and Level 5 for 50 officers. For military, it’s a Level 3 favour to get 1 soldier for a mission, Level 4 for 4 soldiers, and Level 5 for 12 soldiers. For the purpose of this mission, soldiers just count as normal officers for the missions Case a District and Scout, but count as 4 officers each in other missions. DC 30 Diplomacy or Intimidate check per day to pull in a level 5 favour (failing defaults you do to level 4). Enter numbers or hash marks below to keep track of how many officers you have available, how you deploy them each day, and how successful you are. Three TFTs earned from capturing Rufus Hammerton. Difficulty: Unless otherwise noted, all skill checks are DC 23. This challenge has three goals which the party pursues simultaneously. Successful skill checks, clever ideas, or good role-playing can count as successes, and the more successes the party has, the better chance they have for victory in their mission. Each goal lists tactics that can contribute successes. Some tactics are marked with an asterisk (*). These do not contribute to the main pool of successes, but provide alternate routes to success or make things easier for other checks. This montage consists of seven rounds, each roughly a week in length. Each PC will choose one goal to pursue, then describe how he’ll attempt to reach that goal. If necessary, use a skill check to adjudicate whether the PC succeeds. Once all the PCs have had their turn, a new round starts. Do Busy Work, Leave Fake Paper Trail. (Bluff, Diplomacy, Streetwise, Thievery) The PC pretends to be on another case, or actually pursues some minor investigation unrelated to the Obscurati, or files false paperwork. Act in Secret. (Stealth) Alternately, a PC might arrange a careful system to ensure that no one can get a look at what the party is really up to. This tactic can contribute no more than five successes to the goal, however. Locate Spies. * (Insight, Perception, Streetwise) If the PCs are going to spend their time faking effort, they ought to make sure those efforts are actually being watched by someone. This doesn’t contribute to the main pool of successes, but a success on this tactic makes the above tactics easier, reducing busy work, fake paper trails, and actions in secret to DC 19. Visas, Passports, Miscellaneous Documents. (Diplomacy, Thievery) These items, acquired legally or illegally, provide “proof” for the party’s cover identities. This tactic can contribute no more than four successes. Look the Part. (Bluff) A PC finds appropriate clothes and accoutrements for the whole party, and makes grooming suggestions to aid the disguise. This tactic can contribute no more than three successes. Finishing Touches. (Arcana, Dungeoneering, History, Religion, Streetwise) The appropriate skill depends on what cover the party is using, but a PC could coach the party on topics their cover identity would know. Docks and Ports. If the PCs need to sneak in or out of a city or get contraband delivered, this contingency will ensure they have allies they can turn to at the docks of one of the six coastal cities along the railroad (Nalaam is in the mountains). These allies might only number five or six, and they won’t fight for the party, but they’ll act as look-outs or do safe favours. The main challenge to this contingency is to arrange and communicate codes and signals to people across the sea. After all, the PCs and their allies have likely never met before. Each time the party chooses this contingency, they can arrange contacts in another city’s port. Enclaves. Each night the train stops in a Danoran-owned enclave with entertainment and lodging. Each time the party pursues this contingency, they can arrange for allies in one of the seven cities along the railroad. As above, these allies won’t fight for the party, but they can be a useful extra set of hands. Friendly Passengers. Each time the party chooses this contingency, they can arrange for one Allied Passenger to be in the coach cars, ready to act when they see the right signal. Eyes on the Train. (Streetwise) With a successful check, a PC can arrange for a low-level RHC agent to get a job aboard the train, likely as cleaning or cook staff. If the party succeeds a second check they can also get someone hired on to the train’s security detail. Teleportation. (Arcana) If the party is not able to do so themselves, they might need a mage to teleport them, particularly if they get thrown off the train and need to catch up to the next stop. Only Trekhom, Nalaam, Sid Minos, and Vendricce have teleportation circles. A successful check gets a mage in one of those cities to wait on retainer, ready to teleport the party. These cities’ teleportation circles are in secure facilities under heavy guard. While foreigners are allowed to enter, they will be questioned thoroughly, subjected to mild divinations, and asked to pay for a teleportation visa if they do not already have one (at the cost of 500 gp per person, valid for five years). Care Package. (Diplomacy) If the party is capable of performing Sending rituals, they can requisition gear from the RHC just as if they were present in person. After first making an Arcana check to get a mage on retainer in Flint, the party will have to convince the RHC’s quartermaster to be ready to hand over requested items to the mage. If successful, the party performs the ritual, uses the normal Prestige rules to requisition items, and then the items are delivered via teleportation to the city of their choice. The time required is roughly 8 hours longer than normal. Can have up to 20 points of barricades. Can have up to 10 points of barricades. PCs can’t enter or leave the area if there are more than 5 points of barricades. Timeline. Each round is one minute. Allies arrive in round ten, and if the sea gate is open, the PCs win. Each round, first all the PCs act, then all enemies act. Enemies that are destroyed still act and are removed at the end of the round. PCs reduced to 0 HP automatically stabilize and do not make death saving throws. Tracking Locations. Place PC minis in the appropriate area whenever they move. Use coins or dice to keep track of how many enemies are in each area. Assemble Barricade. Athletics DC 18. Create 3 points of barricade inside lighthouse, or 2 points outside lighthouse. On a failed check, create 1 point. Area must have no enemies. Battle. No check or attack roll required. Destroy 1 enemy you can reach. Spend encounter power to destroy 2, daily for 3. Brace. Endurance DC 18. Barricade in your area resists first 2 points of enemy action this turn. Set Trap or Ward. Arcana or Thievery DC 18. When enemies enter this area, destroy 1 enemy. The trap is expended. Stall. Diplomacy or Intimidate DC 18. Enemies don’t advance this turn. +2 DC per round. Other. PCs can also use non-attack powers without counting as an action, at the DM’s discretion. Usually this will be to heal themselves or each other. Remember that you have second winds. Enemy Turn. Enemies move as far as they can toward the lighthouse interior. They stop when they reach a location with a PC, trap, or ward. If there are any barricades in an area, they stop before entering that area. Remove 1 point of barricade from an adjacent area until there are no adjacent barricades. Deal 6 damage to a PC that shares the area with the enemy. PCs can choose who among them take the damage. Deal 3 damage to a PC in another area.